BELIZE CITY (August 24, 2016) – Norwegian Cruise Line has presented a donation of BZ$100,000 (US$50,000) to assist the people of Belize in the recovery efforts after Hurricane Earl’s impact on the country last month. 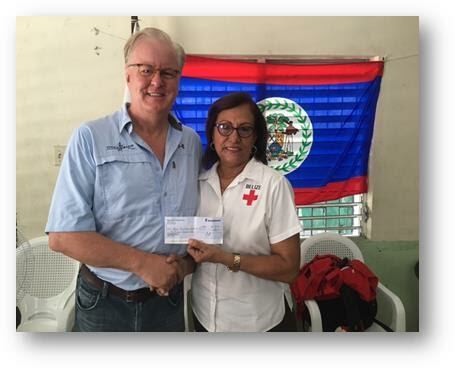 On Friday, August 19, Norwegian Cruise Line Holdings Senior Vice President of Destination & Strategic Development, Colin Murphy (above left), presented the donation to Lily Bowman, Director General of Belize Red Cross Society (above right). “We were devastated to hear of Hurricane Earl’s impact on our neighbors in Belize and are proud to support organizations such as the Red Cross Society to help residents rebuild and regain some sense of normalcy after this natural disaster,” said Colin Murphy, Senior Vice President of Destination & Strategic Development for Norwegian Cruise Line Holdings. The company has three ships on order including Norwegian Joy, the company’s first purpose built ship for China, and is also developing the Western Caribbean’s premier port of call at Harvest Caye in Southern Belize, set to open in November 2016. For further information on Norwegian Cruise Line visit www.ncl.com; contact us in the U.S. and Canada at 888-NCL-CRUISE (625-2784); or follow us on the following social channels for the latest company news & exclusive content: Facebook, Instagram and Youtube: @NorwegianCruiseLine; Twitter, Periscope and Snapchat: @CruiseNorwegian; and WeChat: @gonclcn. High resolution, downloadable images are available atwww.ncl.com/media-center.